Anne's Food: Daring Bakers: Pizza Tossing Time! 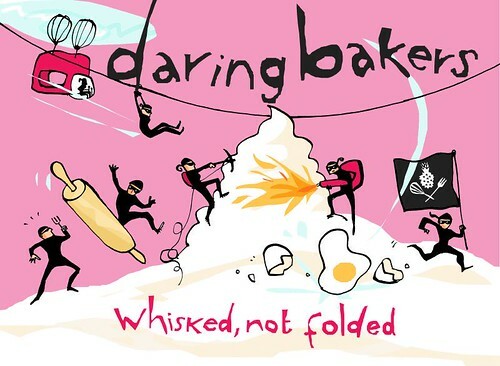 Daring Bakers: Pizza Tossing Time! It seems to have been a while since I started off a Daring Bakers post with this, but: I cheated. Yes, I sure did. By not making the dough. Instead, I sneakingly suggested to Dagmar that we'd make the pizza together one sunny Sunday afternoon, and she happily agreed. And made the dough. So, no real comments on how it came together, but it was definitely nice to work with and easy enough to shape. Not to toss though. We tossed, and tossed, in order to get good photos but it did absolutely nothing for the pizza bases that had to be re-shaped from scratch after the tossing. And no, it did not get easier as we went along. We topped our pizzas with all kinds of goodies - salami, smoked ham, mozzarella, tomato sauce, arugula, fresh mushrooms, red onion... delicious! And we baked them on our iPinium oven sheets - they work much as baking stones, since they have superior heat retention. It worked very nicely to give a nice, crusty base. So, challengewise - this wasn't the tastiest pizza crust I've tried, and I think I'll be sticking with my Jamie Oliver recipe until I find a super-good one, but it was perfectly fine. And while not extremely challenging, pizza is not something I make a lot either, so it was fun! And it was *very* much fun to share the challenge with Dagmar! For more fun photos, and her post, go here! You can find the recipes here, the blogroll here, and the discussion forums - open to everyone! - here. You do that like a pro! And you pizza looks wonderful. Great job! Candace - oh, wish it was mine, but that's Dagmar's kitchen. It's lovely! Can I just say that I love your kitchen?! Your pizza looks so good! That's a great pizza tossing picture. It seems like a lot of people had trouble with the tossing-- my first one was a total mess but the second one came came out pretty well. I didn't really end up tossing it though- more just bouncing it on top of my knuckles and stretching it out. This is my first challenge, and between posting my own post and lurking around other Daring Bakers - I spent more time in looking and 'ooohh-ing' on other Daring Bakers posts!! Your pizza looks soo delicious! its not cheating just sharing :). your pizzas look yummy and great job tossing! I love your tossing photo. Your pizza looks so good! That looks delicious! Now I'm in the mood to try out new pizza recipes. Great tossing picture! Your pizzas look fabulous! Very well done! Your pizzas look fabulous and the tossing is great! Sorry you had to reshape after tossing but the end results look fabulous! Great pizzas--and what a beautiful kitchen! Your pizza looks so authentic. Lovely sounding toppings and what fun to make one together. I think it was an excellent idea to suggest us doing the pizzas together :-) I had great fun! That's not cheating, that's smart! I wasn't sure what the tossing was going to accomplish either. It was fun to toss the dough but mine were all mishapen too. Nice that you and Dagmar baked together. Well you look like masters at tossing! How fun you got to this together. They look delicious! You guys don't know what *real* pizza is like. 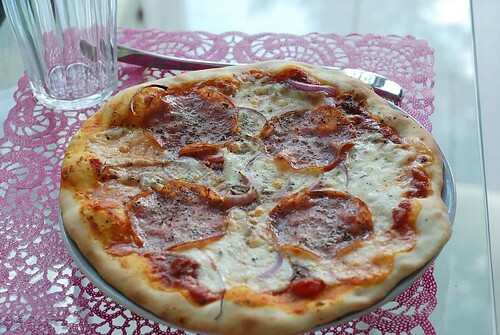 Someone on the other side of the pond should try thin-crust, brick-oven (high-heat) pizza. In my town (New Haven, Connecticut, US) we have had the pizza of Neapolitans who immigrated at the early part of the 20th century. I don't think they make it like this in Naples any more either. The following blog documents two restaurants that have been in existence for decades, Pepe's and Sally's. 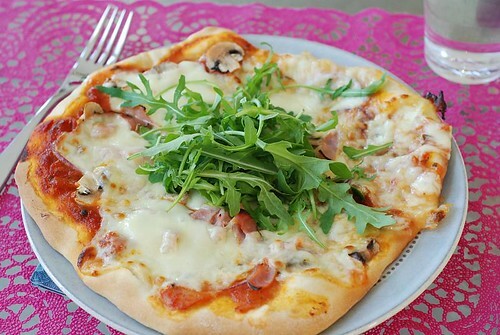 These are the most famous, though there are a number of places here that make this kind of pizza. No one ever makes it at home, you can't make it better then they do! p.s. We are on the sound here. I'm not sure whether it was the idea of the Neapolitan immigrants or someone else, but as you will see in the blog articles, one of the favorite specialties is a white clam pie. This is made without tomato sauce. Some recipes use olive oil, others use butter, some people want mozzarella, but most purists don't want cheese with clams. Of course, lots of chopped garlic is standard. Well the picture of the toss you have on the blog is terrific. I'm having guest over, and we're going to all toss pizza tonight. I hope it doesn't all end up on the floor. My husband suggested that I have a second batch of dough ready, just in case. Great looking pizza. Healthy AND fun - how's that for a winning combination? What a tossing photo love the look of your face. The pizzas look wonderful. How cute are you tossing your pizzas? I guess it's better than tossing your cookies. Hehehe. I think your pizzas look fabulous - much better than delivery. What a great picture of you!!! I just love it! Will you be at the Food Fair next week? Hope to see you. i saw the pic on dagmar's just a few minutes ago!! you sneaky girl. but you both looked like you were having a ball. the pizzas look great! 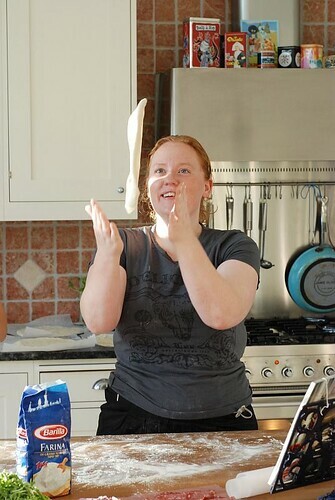 What a lovely pic of you tossing pizza! Well done. Just found your blog after searching for an espresso caramel recipe which by the way looks awesome and expertly wrapped. Also saw that you are in Daring Baker's so wanted to say that you and Dagmar did a fabulous job of tossing the dough and the finished pizzas look great. 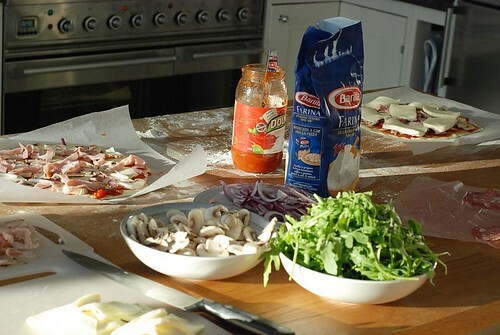 Now that;s how to toss pizza dough! You look like a pro. Oh, btw, delicious looking pizza too! Sounds like loads of fun! It's always great to bake with a friend :) Love the pic of you tossing and the finished products look fantastic.